This outfit pretty much represents my ideal summer outfit. It’s simple and comfortable. Denim is back in full swing, not that it has ever disappeared and I think it never will. I can pair it with anything my heart desires and it can be stylish enough to spark up even a simple t-shirt. I don't think that my T-shirt is simple or even boring. 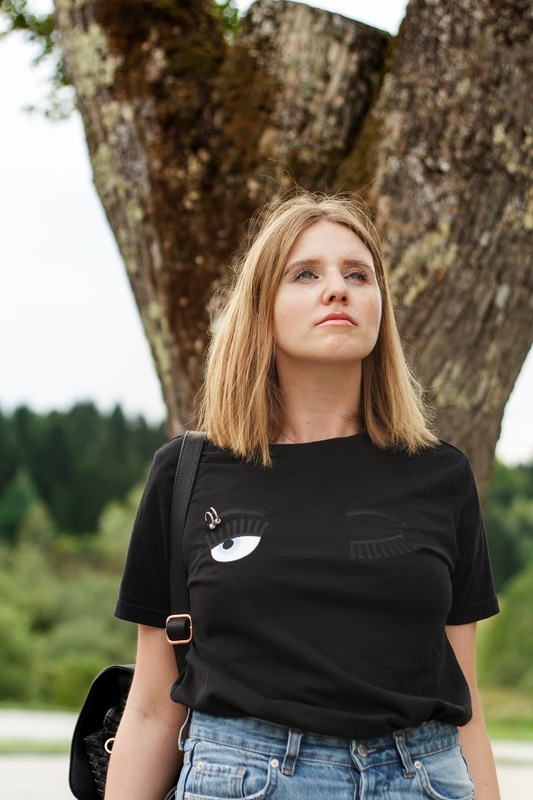 It's a tee from the one and only one Chiara Ferragni, she is one of the most successful fashion bloggers and influencers. She was one of the first bloggers I started reading on a daily basis so it feels only right to own something from her line. If you were wondering my slippers are fine, nothing happened to them, not even the smallest explosion! They are just so comfortable and a little edgy, perfect to spice up every outfit!